I would like to record some audio messages from the Internet. I usually play the message on Firefox 3.0.11 and would like to record them using either Apple’s Soundtrack Pro V1.1 or Adobe’s Soundbooth CS4 V2.0.1. However, I cannot get either program to record the sound. Any ideas? After installing Soundflower, open the Sound system preference, click the Output tab, and choose Soundflower (2ch). You can leave the Input tab alone. 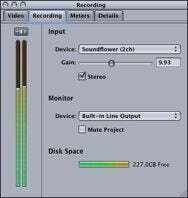 Open your audio editor and choose Soundflower as the input source. In Soundtrack Pro you can do this by record-enabling a track and in the resulting Recording palette choose Soundflower (2ch) from the Device pop-up menu. To listen to what’s playing, choose the output you normally listen to (Built-in Line Output or Headphones, for example) from the Device pop-up menu in the Monitor section of the Recording palette. Having done all this you should now be able to capture any audio your Mac plays. If you’re willing to drop some dough on the problem (and gain the flexibility of such features as recording audio from specific applications and creating scheduled recordings) give Ambrosia Software’s $69 WireTap Studio or Rogue Amoeba’s $32 Audio Hijack Pro a try.